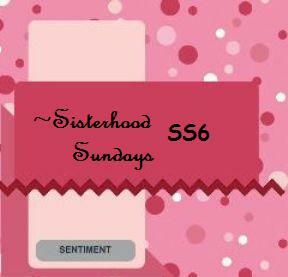 Create With Me: Sisterhood Sundays - A Sketch Challenge! Happy Sunday, Stampers! There's a fun sketch challenge over at the Rubbernecker Stampin' Sisterhood blog today! I'm already in the Valentine's Day mode - so here's a Valentine I created using the sketch. 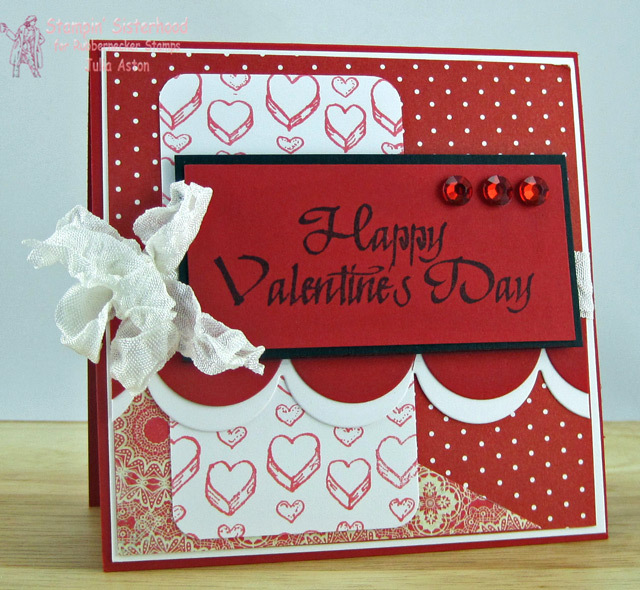 I stamped the hearts on the white panel with Heart Background #28-10 The lovely font sentiment is Stamp Oasis Happy Valentine's Day #1594 SO. I added a double layer of die cut large scallops, some wrinkled seam tape and red rhinestones! I hope you'll join in on our Sunday Challenges - (there's a new one each week!) - if you link up your creation on the Stampin' Sisterhood Blog, you could win some Rubbernecker stamps! Check out all the deets here. Really Reasonable Ribbon challenge - to make a Valentine and use ribbon on it! Stamps: Rubbernecker - Heart Background #28-10, Sentiment - #1594 SO. Paper: white, pure poppy, true black, DP Textstyle Bitty Dots Basics - PTI, DP Stella & Rose/My Mind's Eye 6x6 pad. Accessories: Wrinkled Seam Tape - Prairie Bird Boutique Etsy Shop, corner rounder - EK Success, large scallop die - PTI, rhinestones - Michaels. Julia this is SOOOOOO Pretty, what a great Valentine and you rocked this sketch!!! FABULOUS! Such a beautiful Valentine Julia! Love the rhinestones! This is one beautiful Valentine card, Julia! Very pretty! I love the double scallop! What a wonderful RED card, my friend. saving to case. hugs from all three of us. This is so pretty, Julia! I love the red and white with that pop of black! Great take on the challenge!! I love your take on the sketch, Julia....what a pretty and classy looking Valentine!!!! Perfect Valentine's card. Love your mix of patterned paper, with a bit of bling. Thank you for joining us at Sentimental Sundays this week. Beautiful valentines day card!!! Thank you for joining us at Really Reasonable Ribbons Challenge this time around, and we hope to see you back for our challenge on the 1st!! !